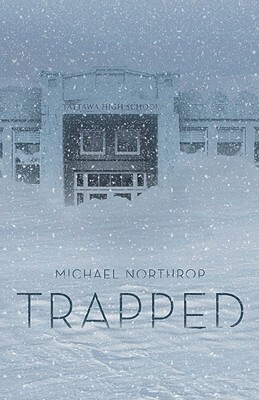 Trapped by Michael Northrop. Grades 7-10. Scholastic Press, February 2011. 231 pages. Reviewed from ARC provided by publisher. When the snow started coming down, Scotty had no idea that the biggest storm of his life had begun. He and six other students are the last ones at school, waiting for rides that will never come. As the snow keeps coming down, piling up feet on top of feet, the seven of them are trapped. And when the power goes out, then the heat... they'll have to figure out what to do to survive. This book completely pulled me in and I was riveted until the very last page. I was reading this book at night (and I read the bulk of it in one night because I just couldn't put it down) and no, it wasn't snowing outside. But when I got up to put my laundry in the dryer, I found myself startling at every little movement and I stopped to figure out why I was so freaked out. It was because while reading this book, I had convinced myself that there was fifteen feet of snow piled up outside my apartment and I was going to have to survive alone until it all cleared up. I had to have a little talk with myself and convince myself that I was NOT stuck in the middle of a catastrophic nor'easter. Yeah, this book freaked me out to the extent that Life As We Knew It by Susan Beth Pfeffer freaked me out (and that book had me foraging in the cupboards and eating handfuls of chocolate chips...). I started thinking about how much canned food I had, how I might cook some of the frozen stuff (I do have a fireplace, so that would be a help if I could keep it unblocked). I don't really know my neighbors in my building, but I would guess that we'd all pool together if we had no access to other people. That's how real this book felt: I was MAKING PLANS for the fifteen feet of snow. I thought the pacing was perfect and it's all narrated in a realistic guy voice. The story concentrates on plot without a lot of character development, but that's just fine because that totally works for this book. I'd definitely try this on reluctant readers. You could call it a "guy book" but girls will dig it, too. It's short and fast-paced, with a realistic narrator. I'd hand it to fans of Susan Pfeffer's Life as We Knew It, maybe Hatchet by Gary Paulsen, or anyone looking for an engrossing survival story. Check out more reviews at Stacked, Y.A. Love, Just Your Typical Book Blog, and The Compulsive Reader. Michael Northrop is also on a blog tour, so check out those posts. And read his thoughts on the excellent cover for Trapped over at that cover girl.